We are engaged in manufacturing, supplying an excellent range of Volley Ball. 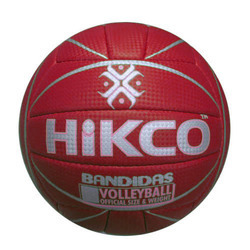 Our range of volley ball are manufactured using qualitative material sourced form reliable vendors. Finest quality vollyballs are available.Raw materials used in manufacturing are mainly Synthetic and Plastic PU which are of the best quality. The manufacturing process includes Lining cover material, Panel cutting, Bladder making and Stitching.